How do you do to have this text editor? You copy the X++ Code in a special editor? E-mail me, and I will forward you the details of the changes you need to make to your blogger template in order to allow for this. Q:what's about a "group by" on the date-part? p.s. :a comment to A7: using OnlyFetchActive can be dangerous when the datasource is not readonly. try it yourself: make a form with a custtable-datasource, set onlyfetchactive and put the fields accountnum,name,partyid,language,custgroup and currency onto it. edit the content of the name-field and watch on the custtable-standard-form what happens with the namealias-field. Nice work! Thank you for it. About OnlyFetchActive: Totally agree. And, as you can see, the datasource is ReadOnly in the example. But I think this is important enough to mention in the post, for beginners. About GroupBy on Date part: Not possible, sorry. Nice Vanya, I'll make the translation to pt-br and link to your post! Congratulations! hi vanya .. its me again. btw ... have try to export n import in AX2009. i have two instance/AOS for example A n B.
at 'A'&'B' i hve a same table(ex. TransportTable) with the same structure, ...its 5 Field. At 'A' i reduced the field so i have 3 Field for TransportTable. I am really confused by one thing. If I run the "Apply DateTime range" function for different days (and the same time, 8:00), resulting WHERE clauses use time differently (see examples below). Do you have the same result and if so, do you have an idea why it behaves this way? Hmm. On 2 boxes that I tried it outputs exactly the same time as specified (T08:00:00) for all 3 dates. So, did I understand correctly that before execution it shows the correct date/time in the infolog? And only when actually executing it produces the result from above? Your problem is well-known, as well as the solution. When doing import into instance B, you have to tick off the "Delete table and class members" check-box under Options in the import dialog. This will ensure that any non-existent fields/methods/etc. on the table will be removed during import. Note, that you have to be on the same layer as the object being imported in order to delete any of its members. Vanya: I finally found the source of problem. At first, I simplified my example (to filter a single value, not a range) and run the check for all days in one year. I discovered that values are incorrect (time is ignored) for all days with the number lower than 10 (<10.1., <10.2. etc.). If I change date format (in Regional and Language settings in Windows) from 'd.M.yyyy' to 'dd.M.yyyy', it works correctly. Hmm. I have tried switching the settings to Czech, but it still shows the correct data and time for me. Strange. I am quite sure that the problem is in the date format. BTW AX must be restarted to apply new regional settings. Oh. OK, so it is actually 2 digits, when needed. good. Yeah, I restarted AX, obviously. The only difference I can see is that I tried it on AX6, while you tried it on AX2009. Maybe there was a bug and it was fixed. Nice post. By the way, I'm intrested to that HTML-Style thingy which displays X++ source code as fine as in the current post. Can you please give me a mail (as to Anonymous' Request on 27.02.10) what I have to change/implement into Blogger? We are trying to extract data from the ProdJournalTable based on a date/time range. For example, we have employees whose shift is Monday - Friday 1600 - 0200. We are trying to report on their transactions for the entire shift. Is this possible? is it a known bug, that when I use a UtcDateTimeField as TitleField, the regional-settings will be used twice? No, this is the first time I see this issue. Guess nobody uses DateTime fields as TitleFields. I have reported the bug into the Microsoft internal system, and will let you know if there is a workaround. I doubt it though, as this is controlled by the kernel. I'am having a problem about QueryValue range expressions and the UTCDateTime fields. The problem is to use the '==' comparison. I Cant seem to find the Value wich is the exact match for a UTCDateTime field value. 1. Is there a problem with '==' in QueryRange value expressions? 2. Should the date used in the expression be a UTC value? 3. Is there a specific dateTime value format to use(Iam using queryValue() perhaps the returned format isnt valid)? In the example below the 'valueStr' is used as a range on a UTCdateTimeField. How would I get my current time only using DateTimeUtil? Sorry for the so much delayed reply. I was on vacation the entire June, and just got back to CPH yesterday. Is this still a problem you are facing? Obviously, queryValue() is not correct. There is a special format that should be followed. If you still struggle with this, I can look it up and e-mail you. P.S. By the way, I was not able to use the e-mail you provided above. Not sure if this question is still relevant. yeah, it should work the way you wrote it above. Note that timenow() is still available, so you can just continue using that. Also, check the difference between DateTimeUtil::getSystemDateTime() and DateTimeUtil::utcNow(). As far as I remember, timeNow() would correspond to the second one, utcNow(). It's good to see that 2009 has a functionality for this. However is there a similar approach for 4.0? I'm trying to get a time range. Say get transactions starting from 6am on the 13th to 6am of the 15th. Well, you have to split it up. Hi Vanya! That did the trick :) Now why didn't I think of that... Anyhow, thanks a bunch! 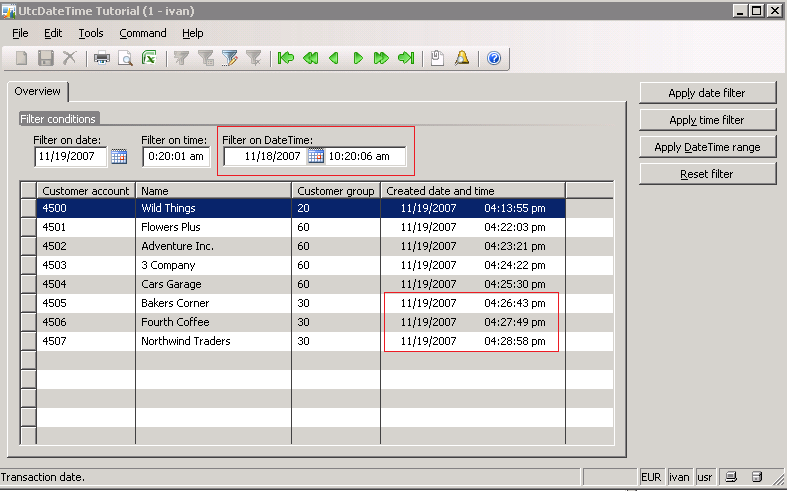 Its a good tutorial for developers to know more about UTC date time in AX 2009. I have a different questions related to inventory management. Hope u can help me. I need to rename the inventory dimensions ( Serial number , Batch number ) in AX 2009. For renaming the item dimensions ( Color , Size ) , the standard functionality have a rename tab but its not availble for other inventory dimensions. Any idea how to rename the other inventory dimensions ? Well, it is not allowing to rename serial number, batch number, as well as Configuration and all the storage dimensions for a specific reason. All these dimensions have a dedicated functional behavior assigned to them. For example, Serial number control for serial number, product configuration (Product builder) for configuration, etc. So it is not "correct" to rename them. You can however create new dimensions, and assign them the required name and functional behavior. If you are still not convinced, you can of course proceed with renaming these, i cannot disallow it. It's very simple, actually. All the rename does is update the labels text in the label file. You can do that manually or using a simple console or X++ application. In AX 4.0 and earlier, when creating user queries (non X++), you can pass the value "D" which would always default to the current date. However, in AX 2009, because of UTCDateTime, this no longer works. Any idea how to achieve the same functionality? "D" or "T" still works from the UI if you put it into the control -> It will default to today's date and time automatically. For using the SysQueryForm (or in AOT queries), you can use the SysQueryRangeUtil class methods. The beauty of it is that you can add your own methods to it as well, to be calculated at runtime if specified in the query. You can find more information about this class on the web, together with usage examples - basically, you just specify the (()) for the filter value. (()) should be replaced with (methodName()). It got eaten up by the XML parser of blogger. how to minus or add UtcDateTime types ? for the example : today - yesterday in UtcDateTime types. Take a look at the DateTimeUtil class. Hi Vanya, I´ve been counting the number of records fetched using SysQuery::countTotal. It works fine for strings, numbers, etc. But when I do a DateTime filter (using only the date), it returns always zero (despite the filter is alright). Do you know what happens? Hmm. No, I have not seen that. Can you send me a sample xpo or code to try out? hi Vanya, how to get only time information from utcdatetime data type? I wonder what if user want to use local time. User may want local date time to be displayed the same manner anywhere. This is to avoid consolidating conflict. If UTC date time is applied to "Invoice date" then users from different time zone may see different values. How to decide which period it falls to? American ppl are looking at August financial report, but does the figures included entries that created in Japan on October 1st? In the database, the data is stored as UTC. So when something is created in Japan in Oct 1st, in the states this data will still be still Oct 1st(or 2nd, depending on the time in Japan). So the August report should go just fine. Now, if the situation was reversed - well, naturally, Japan would need to wait until the working times are over in USA before finalizing the report. What about using in a while select statement? What's the reason for not providing a simple function that returns the current date and time in local time, something like what System.DateTime.Now from .NET does? Why is it necessary that the programmer should go through all the pains of applying timezone offsets etc.? That's a good question, thanks Horia. I guess the intention was for the DateTime to be used in code, thus not requiring offsets that often. I will however write up a DCR for it, to see if we can add a method like this to, let's say, the Global class. Thanks for this post ! Very usefull :) I have another DateTimeUtil problem you might know the answer to. Can't seem to find this anywhere. Sounds so obvious that I'm wondering what I'm overlooking. Do you know if something like this is available ? Nope, I don't think there's a method like that. Can you catch the error? Nope.... Well... I can catch it, but I wanted to prevent the errorlog that is occuring. If I stumble into something like that isValid method I will let you know. Hi Gerard, I have spent some time looking into this. how can i set the timeOfDay value in .NET. I am consuming AIF service in .NET, but i couldn't able to set the timeOfDay field of ProjJournalTrans field correctly. It always goes as 12:00 in the record. Please help in this regard. I am not sure what to say here. Can you show me the code where the problem is, maybe in way of comments? Looking at the above, there are some strange lines, but the query itself should be OK, you get a count of purchase orders for the currently displayed order account that also have the default warehouse specified and equal to the one on your currently displayed purchase order header. I don't see any date filters. tempdate1 and fromDate1 should be the same looking at the above code. is that not the case? Are you sure the filter you put on the query is done correctly? What kind of query do you see if you do info(queryRun.query().dataSourceTable(tablenum(PurchTable)).toString()); ? I have a concern related to the "Daylight saving time" set up in the windows time zone. Where do I find this setup in AX 2009 (MorphX)? How will I get to know in AX that this set up of DST has been enabled? It would be really great if you could help me out in this regard..
Well, I am not aware of a method similar to this in X++. But you can always use the .NET version, I guess. Question is: why would you ever want that information? All you care about is that the date is correct. Well, Daylight saving time is considered by the kernel when it displays the DateTime field in the User Preferred time zone. You can apply the time zone offset based on the user preferred time zone as shown in the blog post above. Thanks a lot Vanya for your support. I will try to apply the time zone offset based on the user preferred time zone. Just wanted to find a simpler way for it if it existed. I'm learning to make job in AX 2009. I'm learning and looking for different days in format utcdatetime. Hi Didik, I am not sure I understood, if that was supposed to be a question, or just a comment on what you've been able to do after reading the post. The question is How to get different Date in UtcDateTime. I mean, with the code I wrote, but the result was not as I wanted. I want the result is the date minus the date ((12/19/2012 08:28:32) - (12/14/2012 10:18:12) = 5)). The value you are getting is the number of seconds in the difference between the two utcDateTime arguments. If you divide it by 3600 and 24, you'll get the exact number of days (because the time is not the same in both). First of all many thanks for your detailled description. I have a question concerning the 'd' (for today). This is often used for reports. We would need a smiliar function 'd-3'. I mean today minus 3 days. Do you know, if this is possible? And how it can realised if it's possible. Hi Roli, I am not sure where exactly you want to do this, so the reply is going to be generic. There's the DateTimeUtil::addDays() which you can use to create the 'd-3' date, setting it in the query range. There's also a SysQueryRangeUtil::day(), which seems to do exactly what you want (you specify 3 as the argument). These functions you can use in the extended range form as well. It would be great, if 'd-3' can be used by the users for calling reports, for filtering etc. not by code. If the report is started next Monday, the 21.1.2013, then the report should list all until the 18.1.2013. The selection-criterias are stored in the SYSLastValues. If the SYSLastValues saves 'd-3' the user can start the report without changing the date-range. Hi Roli, so like I said above, you want to use the SysQueryRangeUtil class for this. Hi Vanya thanks again i will study the stuff under the websites you mentioned.